Tejay van Garderen beat his own Vail Pass Time Trial record Saturday to all but clinch the USA Pro Challenge for the second straight year (USAPC photo). Tejay van Garderen destroyed his own course record Saturday for a dominant win in a rainy Vail Pass Individual Time Trial. The BMC Racing rider from Aspen hammered his way up 10 miles from Vail Village at 8,150 feet to the finish on Vail Pass at 9,600 feet, averaging 24.6 mph and claiming his second stage of this year’s USA Pro Challenge cycling stage race. Van Garderen established the old mark of 25:01 last year en route to winning the overall Pro Challenge title. He beat that mark by nearly 35 seconds on Saturday with a time of 24 minutes, 26 seconds. In the inaugural Pro Challenge in 2011, Levi Leipheimer claimed the stage and ultimately the overall win on Vail Pass, but van Garderen — two-time fifth-place finisher in the Tour de France — has clearly exorcised those demons. Van Garderen now has a 1 minute, 32 second overall lead over Garmin-Sharp’s Tom Danielson, who finished second Saturday. 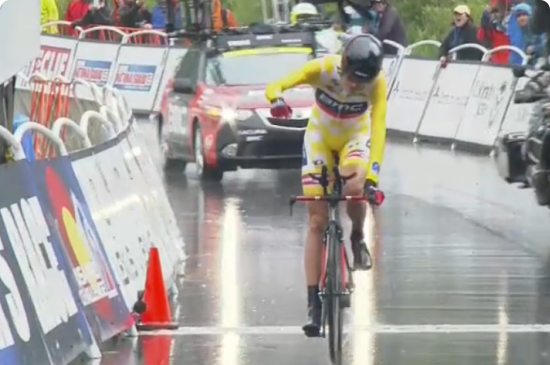 Giving some credit to the weather and BMC timemachine TM01 in the rainy, cool conditions, van Garderen was 53 seconds better than Danielson and 68 seconds faster than third-placed Serghei Tvetcov (Jelly Belly presented by Maxxis). Van Garderen also won the Stage 3 summit finish at Monarch Mountain Wednesday, giving him a race record-tying four career stage wins. He is also on the verge of becoming the USA Pro Challenge’s first repeat winner. “It was really a great day to see Tejay crush it and defend his lead and then extend it as much as he did,” BMC Racing Team Sport Director Jackson Stewart said. The 2014 version of the race concludes Sunday with a stage from Boulder through Golden, up Lookout Mountain and then back down to Denver. “I don’t want to say I have it in the bag, but I am pretty relaxed going into [Sunday] knowing there is not really much anyone can do to take this away from me,” van Garderen said. Making Saturday all the more special, he said, was the performance of his teammates to regain the lead in the team classification. Ben Hermans finished sixth on the day while Peter Stetina was the next BMC Racing Team rider, in 23rd, to overtake Garmin-Sharp by 64 seconds.